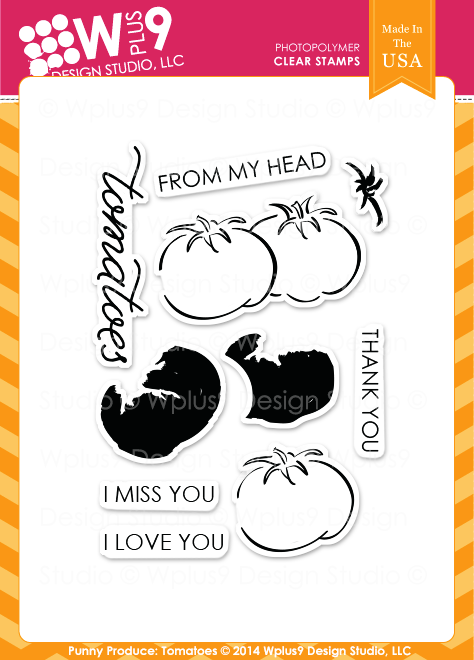 Papell with Love: Wplus9 - Day 4 September Special Release - Tomatoes Anyone? Wplus9 - Day 4 September Special Release - Tomatoes Anyone? Wplus9 September Special 2014 Release. All products will be available September 5. For my project today is all about Tomatoes...Ha! Punny Produce: Tomatoes with Little Bits Stamp Sets. To begin my first project I first stamped the dots from Little Bits using Versamark Ink then heat embossed in Pearl translucent embossing powder, then distress it with Crushed Olive Distress ink. 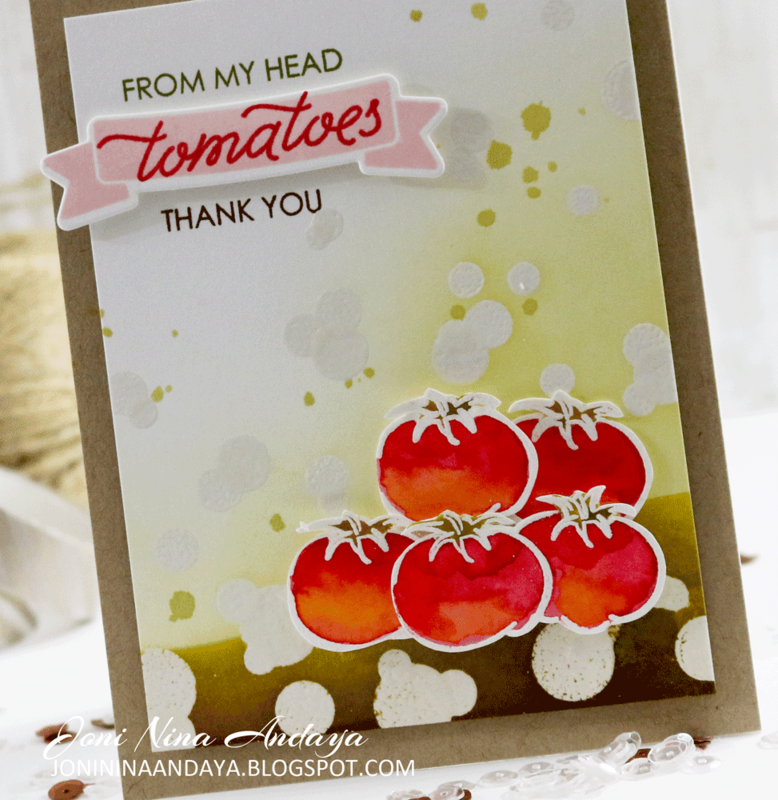 Next, I embossed the tomato images on a watercolor paper with white embossing powder and watercolor it. Once its dry I then fussy cut the tomatoes and adhere on the panel with foam tape. 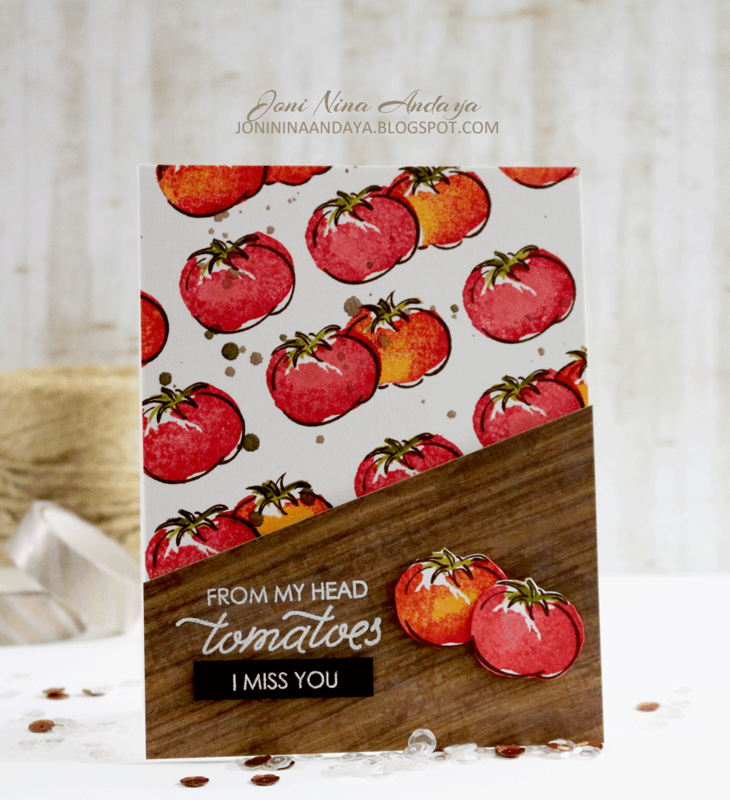 The sentiments are from the Punny Produce: Tomatoes and the banner die and stamp image was from the past release called Basic Banners. I then added some green ink splatters from the remaining watercolor I used to color the leaves of the tomatoes. For my second project on the card panel I first stamped all the tomato images then did some rock and roll technique in coloring the tomatoes. I think the rock and roll technique worked really well with this tomatoes don't you think? 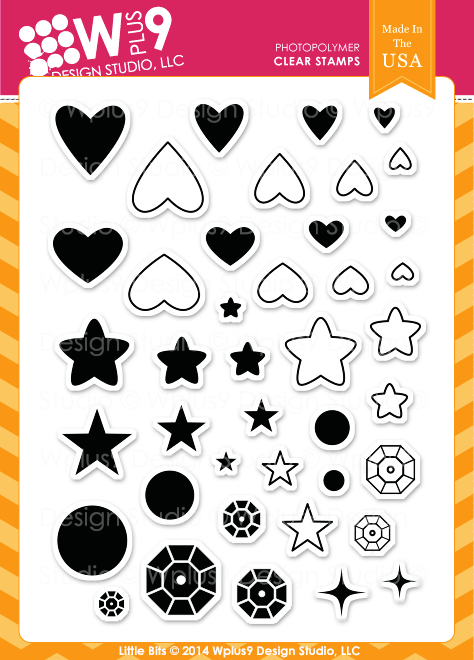 I really love this stamp set...simply mimic the watercolor, this help us not to really fully align the images :). Once the stamping is done I then adhere a wood panel on top then white heat embossed the sentiment. I also fussy cut some of the tomatoes and adhere on the wood grain panel with foam tape. Dawn is also showcasing more Pretty Peonies HERE. Kara also whip up more inspiration HERE. I love love love love these! LOVING those sentiments and the tomatoes!!!!!!! 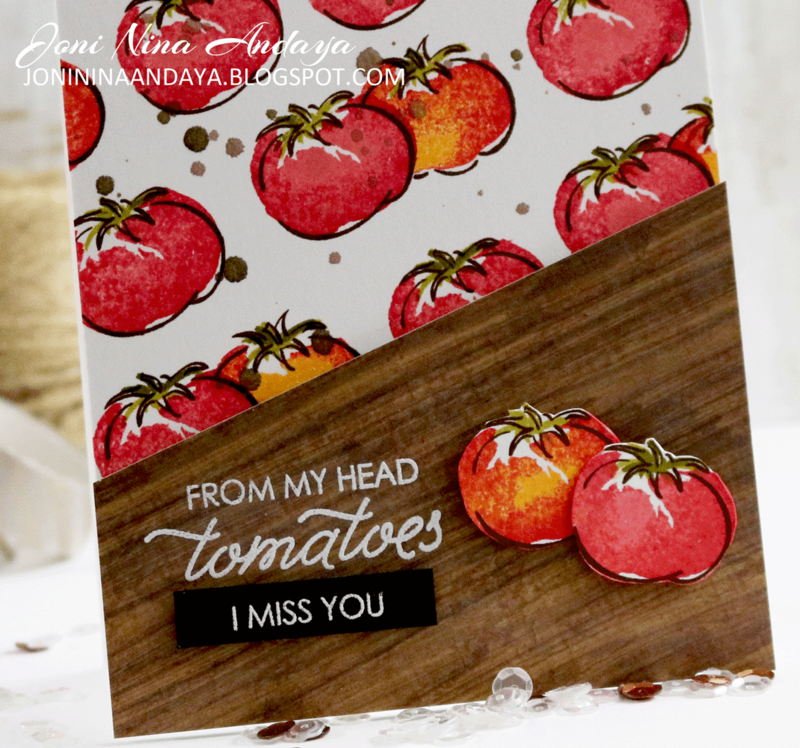 Who woulda thought that one could make a card so gorgeous by stamping tomatoes!?!?!? Beautiful cards! Love that punny sentiment! You have a way with color! Those tomatoes are heirloom luscious! Very cute cards. I never heard of this technique but it looks great. Beautiful coloring on those tomatoes. Super cute cards! Love the sentiment, such a cute pun! Yep, the rock and roll technique works perfectly on those tomatoes. This stamp set is so full of humor and looks utterly delicious. So cute! 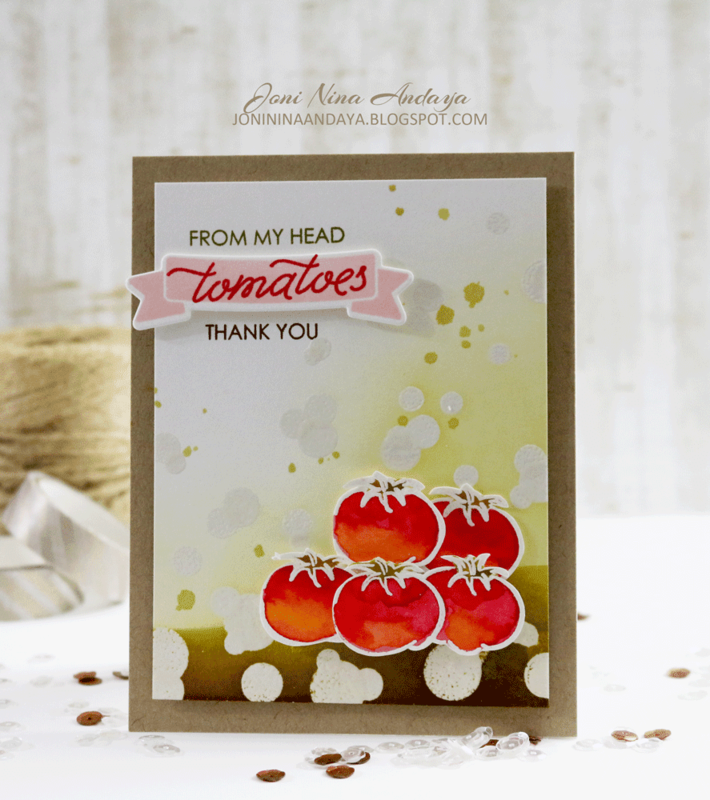 love how you used these tomatoes! beautiful!